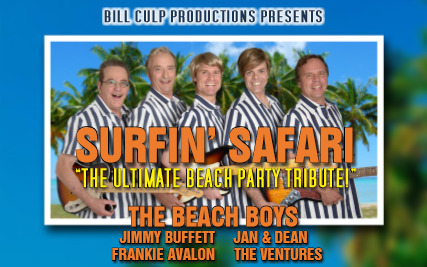 "Surfin' Safari: The Ultimate Beach Party Show" celebrates the music of Jimmy Buffet, Frankie Avalon, Jan & Dean, The Ventures, and of course ...The Beach Boys! Don't miss this fun-filled, audience interactive "beach party show" that combines fabulous musical tributes with an outstanding live band. Song highlights include "Surfin' USA", "Margaritaville", "Surf City", "It's 5 O’Clock Somewhere", "California Girls" “Wipeout” and "Kokomo" amongst the many audience favourites. No matter what the weather is like, it'll be warm and sunny on stage! Get ready to have some "Fun, Fun, Fun"! !